This bundle is our way of offering a discount on Photographer's Friend 3 to owners of version 2. If you already own version 2 you can complete your bundle with the price you paid for version 2 deducted from the cost of the bundle. You can then delete version 2 (with the black and white icon) from your device, as all of the features in 2 are included in version 3. Version 3 now includes the awesome Exposure Shift Calculator and has an updated look. We will only be adding new features to version 3 moving forward. 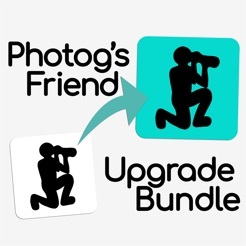 Please do NOT buy this bundle if you do not own Photographer's Friend version 2. If you do not see an option to complete your bundle at a discount, please just buy version 3. Thank you! © 2010 - 2018 Martin Bailey Photography K.K.